I am happy to announce that EFS is now available for production use in the US East (Northern Virginia), US West (Oregon), and EU (Ireland) Regions. EFS is available now in the US East (Northern Virginia), US West (Oregon), and EU (Ireland) Regions and you can start using it today. Pricing is based on the amount of data that you store, sampled several times per day and charged by the Gigabyte-month, pro-rated as usual, starting at $0.30 per GB per month in the US East (Northern Virginia) Region. There are no minimum fees and no setup costs (see the EFS Pricing page for more information). 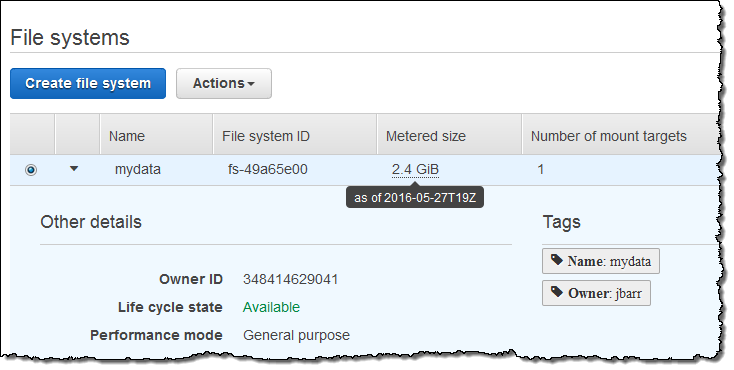 If you are eligible for the AWS Free Tier, you can use up to 5 GB of EFS storage per month at no charge. 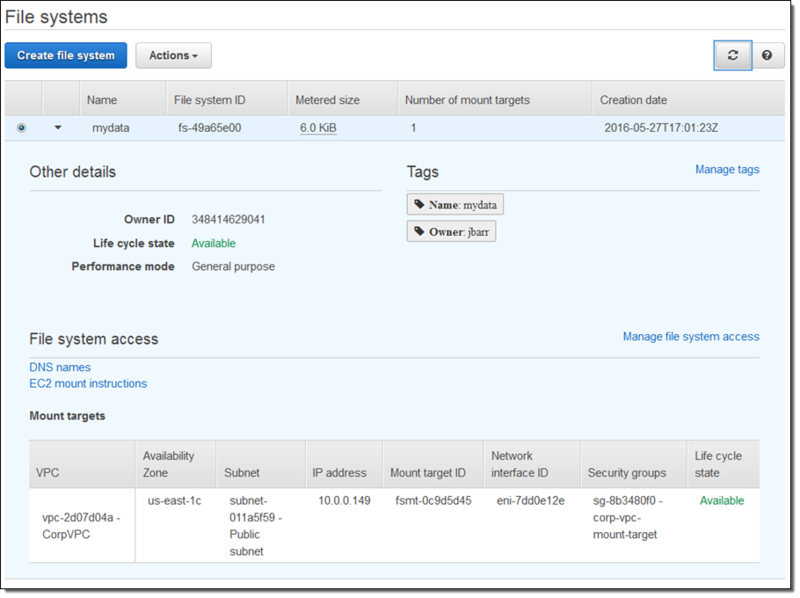 When our users move existing machine images to the cloud for use on Amazon EC2, they occasionally encounter issues with drivers, boot parameters, system configuration settings, and in-progress software updates. These issues can cause the instance to become unreachable via RDP (for Windows) or SSH (for Linux) and can be difficult to diagnose. On a traditional system, the physical console often contains log messages or other clues that can be used to identify and understand what’s going on. In order to provide you with additional visibility into the state of your instances, we now offer the ability to generate and capture screenshots of the instance console. You can generate screenshots while the instance is running or after it has crashed. 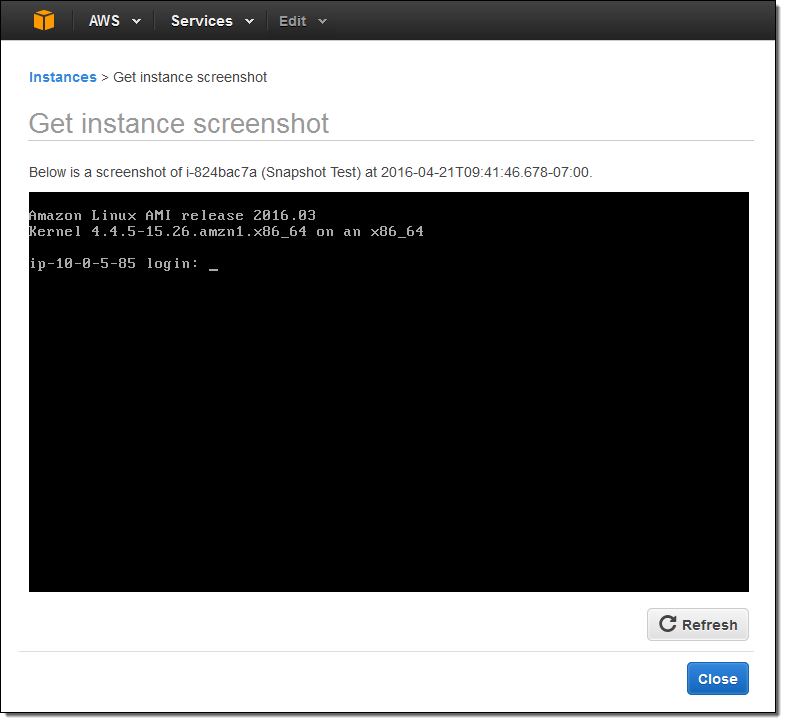 You can also create screenshots using the CLI (aws ec2 get-console-screenshot) or the EC2 API (GetConsoleScreenshot). This feature is available today in the US East (Northern Virginia), US West (Oregon), US West (Northern California), EU (Ireland), EU (Frankfurt), Asia Pacific (Tokyo), Asia Pacific (Seoul), Asia Pacific (Singapore), Asia Pacific (Sydney), and South America (São Paulo) Regions. There are no costs associated with it. 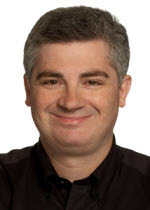 Many AWS customers are running memory-intensive big data, caching, and analytics workloads and have been asking us for EC2 instances with ever-increasing amounts of memory. 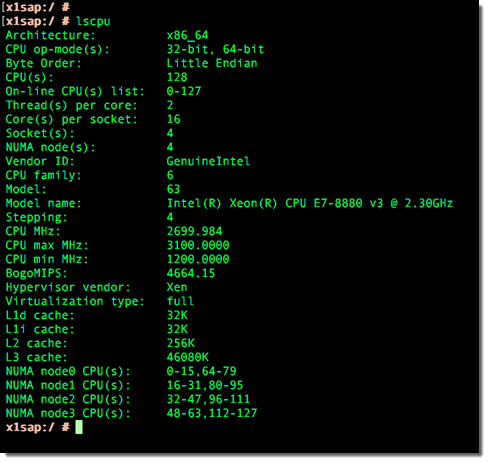 Processor: 4 x Intel™ Xeon E7 8880 v3 (Haswell) running at 2.3 GHz – 64 cores / 128 vCPUs. Memory: 1,952 GiB with Single Device Data Correction (SDDC+1). Instance Storage: 2 x 1,920 GB SSD. Dedicated EBS Bandwidth: 10 Gbps (EBS Optimized by default at no additional cost). The Xeon E7 processor supports Turbo Boost 2.0 (up to 3.1 GHz), AVX 2.0, AES-NI, and the very interesting (to me, anyway) TSX-NI instructions. AVX 2.0 (Advanced Vector Extensions) can improve performance on HPC, database, and video processing workloads; AES-NI improves the speed of applications that make use of AES encryption. The new TSX-NI instructions support something cool called transactional memory. The instructions allow highly concurrent, multithreaded applications to make very efficient use of shared memory by reducing the amount of low-level locking and unlocking that would otherwise be needed around each memory access. If you are ready to start using the X1 instances in the US East (Northern Virginia), US West (Oregon), EU (Ireland), EU (Frankfurt), Asia Pacific (Tokyo), Asia Pacific (Singapore), or Asia Pacific (Sydney) Regions, please request access and we’ll get you going as soon as possible. We have plans to make the X1 instances available in other Regions and in other sizes before too long. 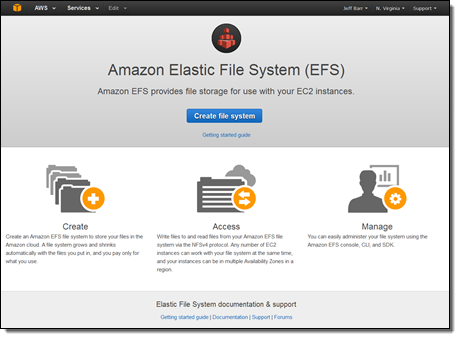 3-year Partial Upfront Reserved Instance Pricing starts at $3.970 per hour in the US East (Northern Virginia) Region; see the EC2 Pricing page for more information. You can purchase Reserved Instances and Dedicated Host Reservations today; Spot bidding is on the near-term roadmap. 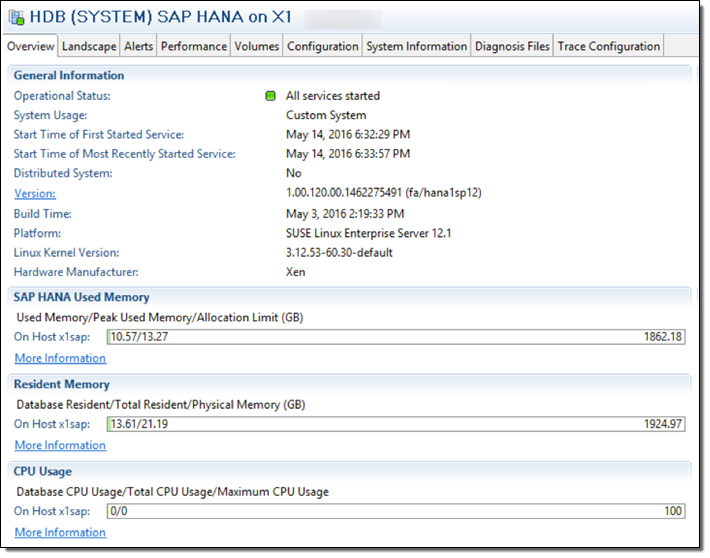 The X1 instances have been certified by SAP for production workloads. They meet the performance bar for SAP OLAP and OLTP workloads backed by SAP HANA. 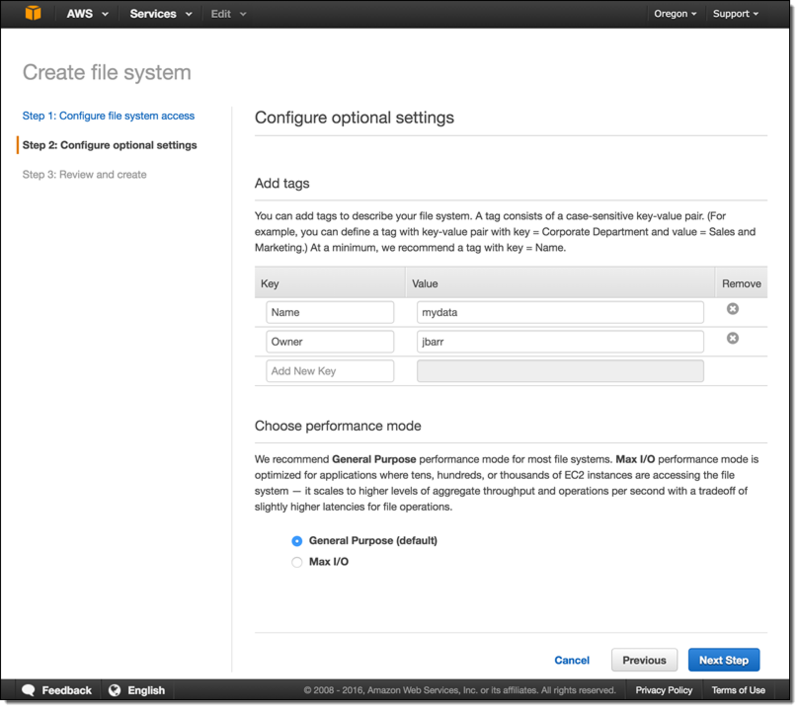 You can migrate your on-premises deployments to AWS and you can also start fresh. Either way, you can run S/4HANA, SAP’s next-generation Business Suite, as well as earlier versions. Many AWS customers are currently running HANA in scale-out fashion across multiple R3 instances. Many of these workloads can now be run on a single X1 instance. This configuration will be simpler to set up and less expensive to run. As I mention below, our updated SAP HANA Quick Start will provide you with more information on your configuration options. 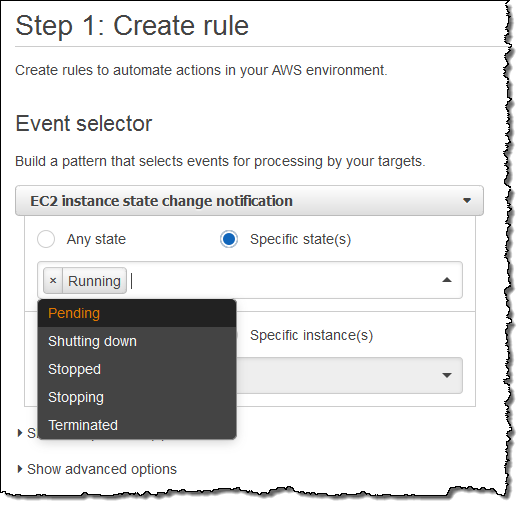 Auto Recovery – Depending on your RPO (Recovery Point Objective) and RTO (Recovery Time Objective), you may be able to use a single instance in concert with EC2 Auto Recovery. 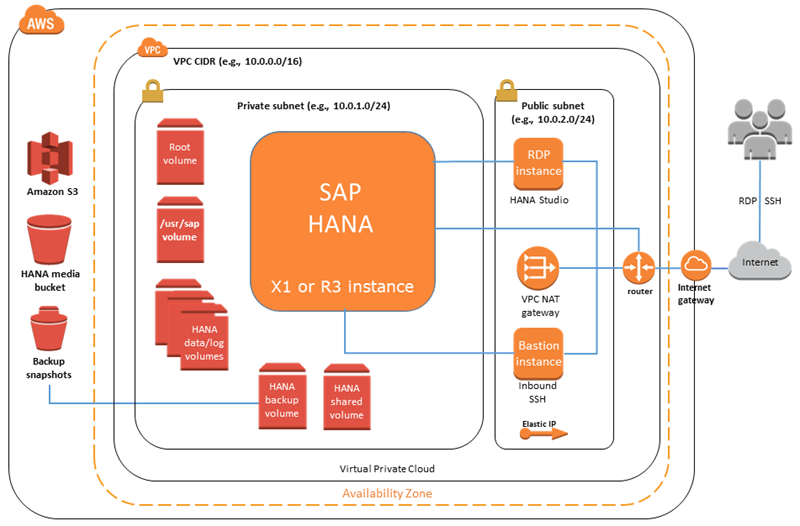 Hot Standby – You can run X1 instances in 2 Availability Zones and use HANA System Replication to keep the spare instance in sync. 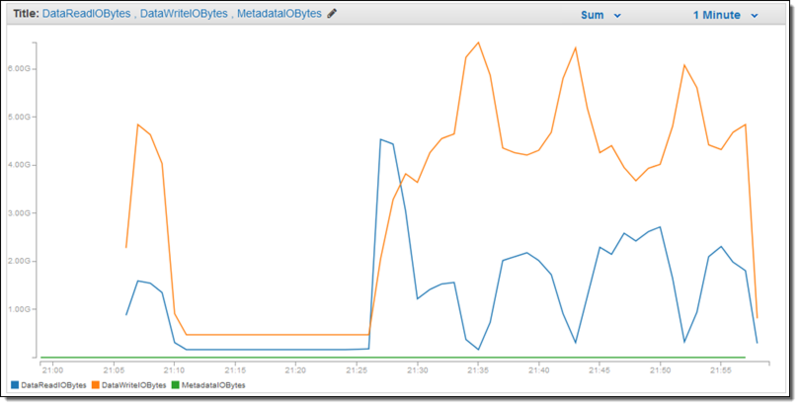 Warm Standby / Manual Failover – You can run a primary X1 instance and a smaller secondary instance configured to persist only to permanent storage. In the event that a failover is necessary, you stop the secondary instance, modify the instance type to X1, and reboot. 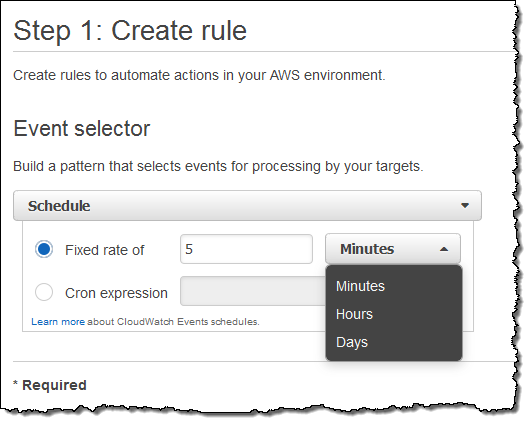 This unique, AWS-powered option will give you quick recovery while keeping costs low. The Quick Start will help you to configure the instance and the associated storage, install the requisite operating system packages, and to install SAP HANA. We have also released a SAP HANA Migration Guide. It will help you to migrate your existing on-premises or AWS-based SAP HANA workloads to AWS. 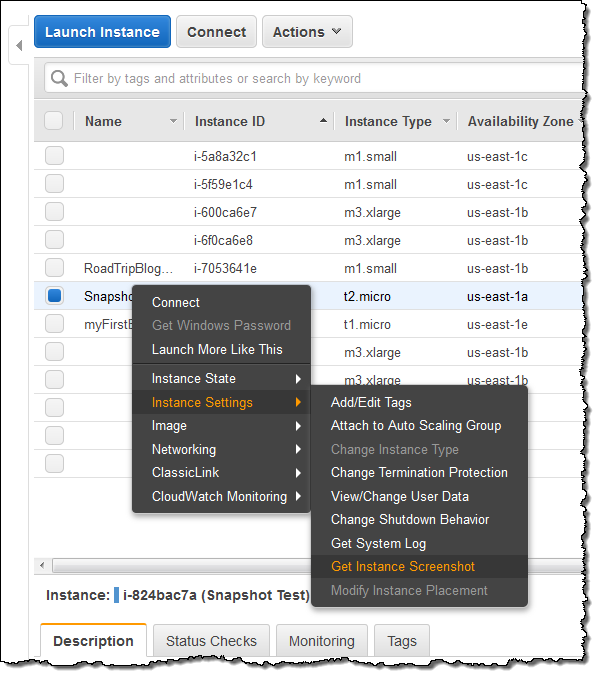 The EC2 Run Command allows you to manage your EC2 instances in a convenient, scalable fashion (see my blog post, New EC2 Run Command – Remote Instance Management at Scale, for more information). 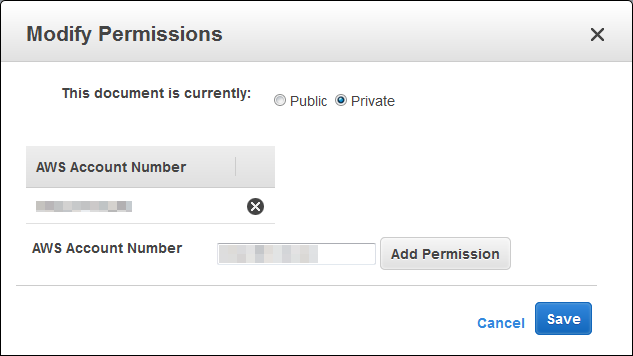 Document Management and Sharing -You can now create custom command documents and share them with other AWS accounts or publicly with all AWS users. 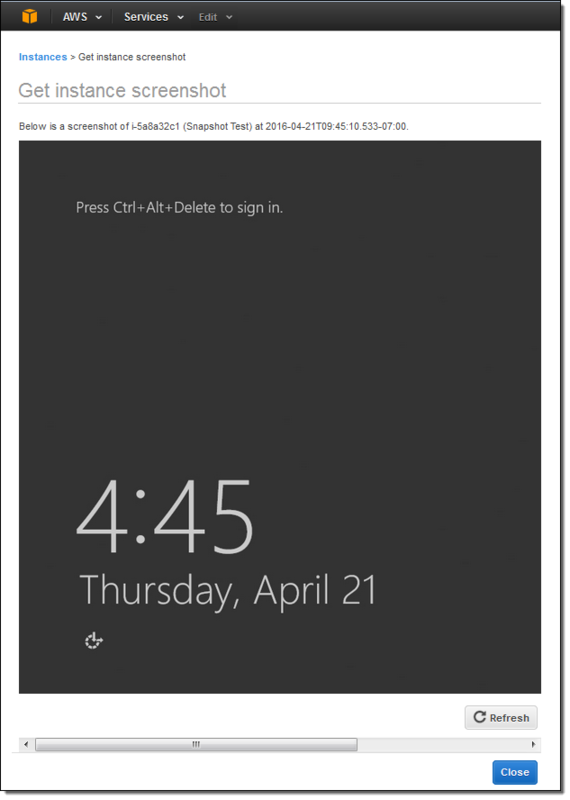 Additional Predefined Commands – You can use some new predefined commands to simplify your administration of Windows instances. Open Sourced Agent – The Linux version of the on-instance agent is now available in open source form on GitHub. 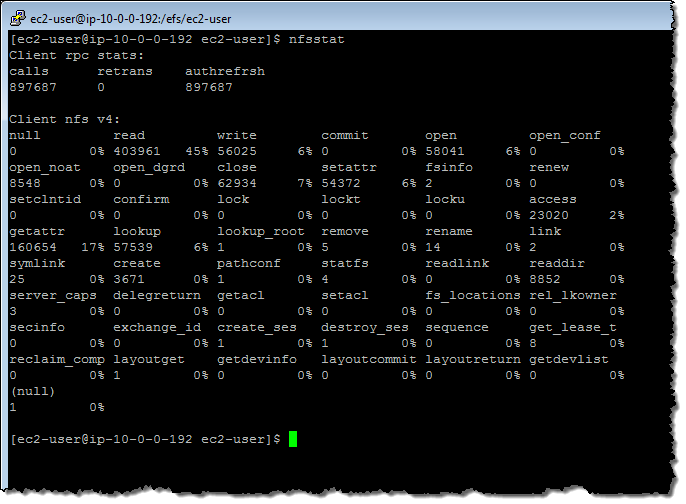 You can now manage and share the command documents that you execute via Run Command. This will allow you to add additional rigor to your administrative procedures by reducing variability and removing a source of errors. 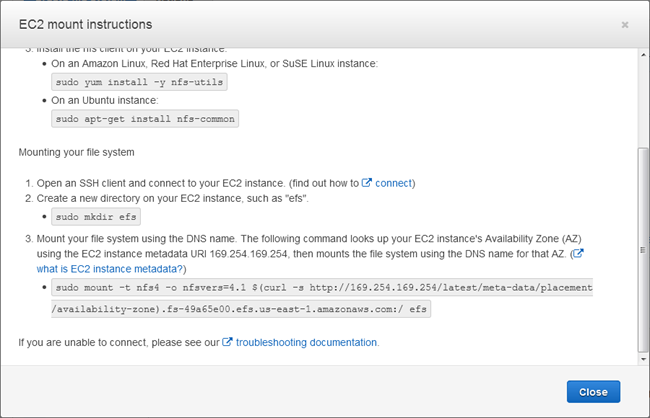 You can also take advantage of command documents that are created and shared by other AWS users. 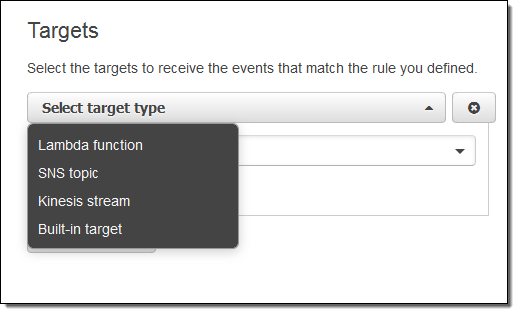 This feature was designed to support several scenarios that our customers have shared with us. Some customers wanted to create documents in one account and then share them with other accounts that are part of the same organization. Others wanted to package up common tasks and share them with the broader community. 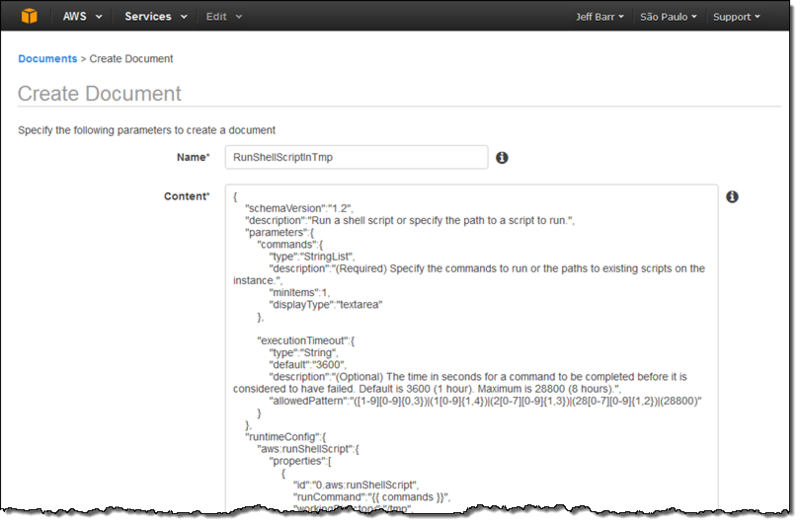 AWS partners wanted to share documents that would encapsulate common setup and administrative tasks specific to the offerings. 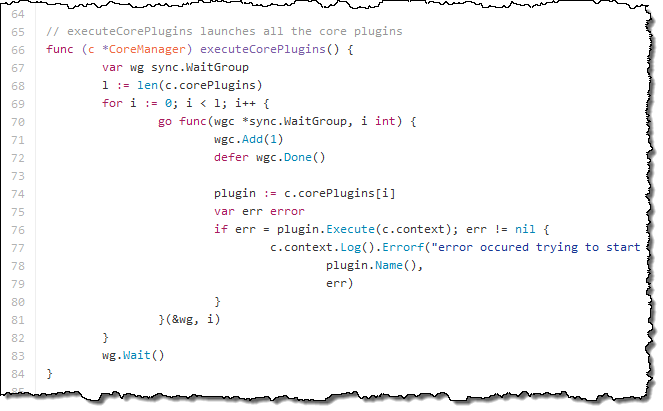 Read about Creating Your Own Command to learn more about this feature. 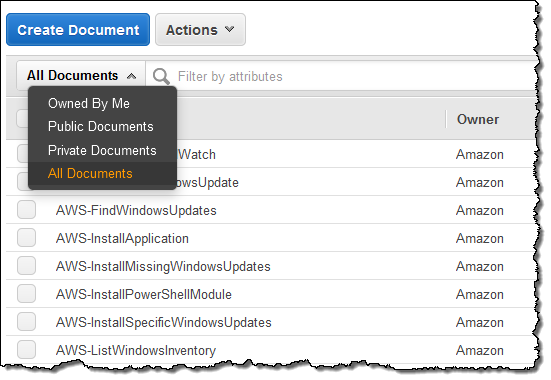 AWS-ListWindowsInventory – Collect on-instance inventory information (operating system, installed applications, and installed updates). Results can be directed to an S3 bucket. 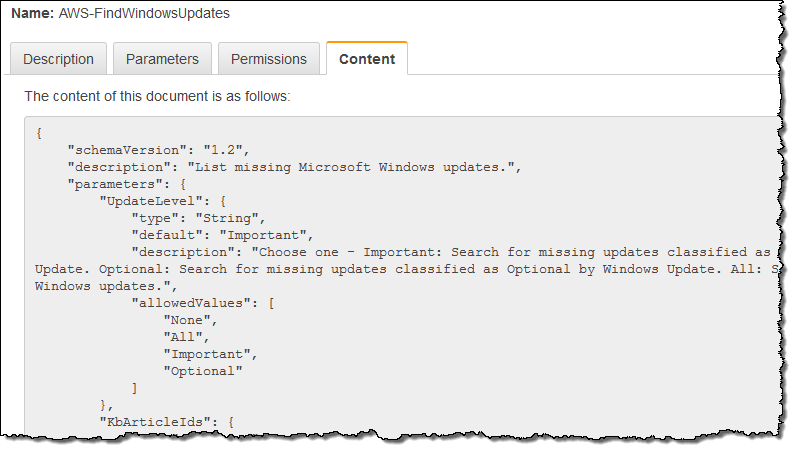 AWS-FindWindowsUpdates – List missing Windows updates. AWS-InstallMissingWindowsUpdates – Install missing Windows updates. AWS-InstallSpecificWindowsUpdates – Install a specific set of Windows updates, identified by Knowledge Base (KB) IDs. The Linux version of the on-instance Simple Systems Manager (SSM) agent is now available on GitHub at https://github.com/aws/amazon-ssm-agent . You are welcome to submit pull requests for this code (see CONTRIBUTING.md for more info). The features described above are available now and you can start using them today in the US East (Northern Virginia), US West (Oregon), EU (Ireland), US West (Northern California), EU (Frankfurt), Asia Pacific (Tokyo), Asia Pacific (Singapore), Asia Pacific (Sydney), and South America (São Paulo) Regions. 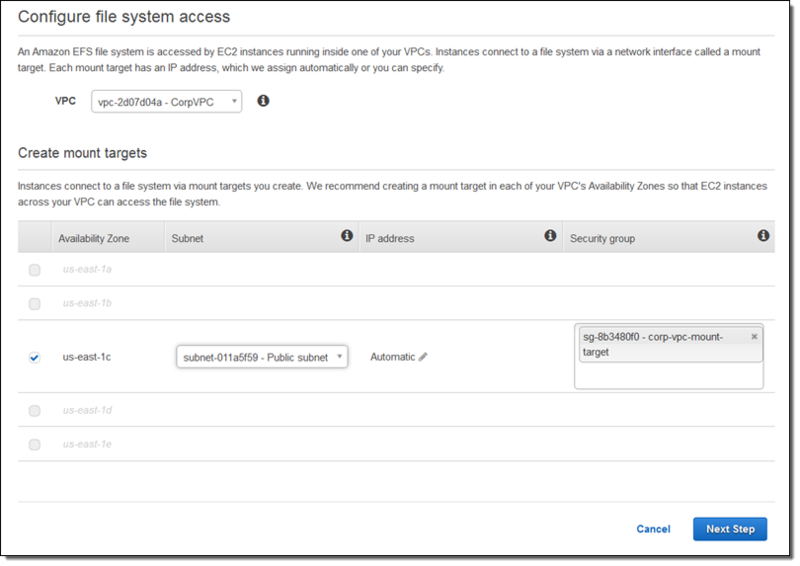 To learn more, read Managing Amazon EC2 Instances Remotely (Windows) and Managing Amazon EC2 Instances Remotely (Linux). My colleague Sanjay Padhi is part of the AWS Scientific Computing team. He wrote the guest post below to share the story of how AWS provided computational resources that aided in an important scientific discovery. The Higgs boson (sometimes referred to as the God Particle), responsible for providing insight into the origin of mass, was discovered in 2012 by the world’s largest experiments, ATLAS and CMS, at the Large Hadron Collider (LHC) at CERN in Geneva, Switzerland. The theorists behind this discovery were awarded the 2013 Nobel Prize in Physics. Deep underground on the border between France and Switzerland, the LHC is the world’s largest (17 miles in circumference) and highest-energy particle accelerator. It explores nature on smaller scales than any human invention has ever explored before. 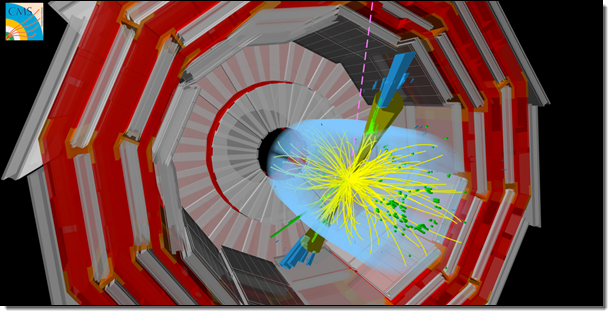 The high energy particle collisions turn mass in to energy, which then turns back in to mass, creating new particles that are observed in the CMS detector. This detector is 69 feet long, 49 feet wide and 49 feet high, and sits in a cavern 328 feet underground near the village of Cessy in France. The raw data from the CMS is recorded every 25 nanoseconds at a rate of approximately 1 petabyte per second. After online and offline processing of the raw data at the CERN Tier 0 data center, the datasets are distributed to 7 large Tier 1 data centers across the world within 48 hours, ready for further processing and analysis by scientists (the CMS collaboration, one of the largest in the world, consists of more than 3,000 participating members from over 180 institutes and universities in 43 countries). Fermilab is one of 16 National Laboratories operated by the United States Department of Energy. Located just outside Batavia Illinois, Fermilab serves as one of the Tier 1 data centers for Cern’s CMS experiment. With the increase in LHC collision energy last year, the demand for data assimilation, event simulations, and large-scale computing increased as well. With this increase came a desire to maximize cost efficiency by dynamically provisioning resources on an as-needed basis. In order to address this issue, the Fermilab Scientific Computing Division launched the HEP (High Energy Physics) Cloud project in June of 2015. They planned to develop a virtual facility that would provide a common interface to access a variety of computing resources including commercial clouds. Using AWS, the HEP Cloud project successfully demonstrated the ability to add 58,000 cores elastically to their on-premises facility for the CMS experiment. 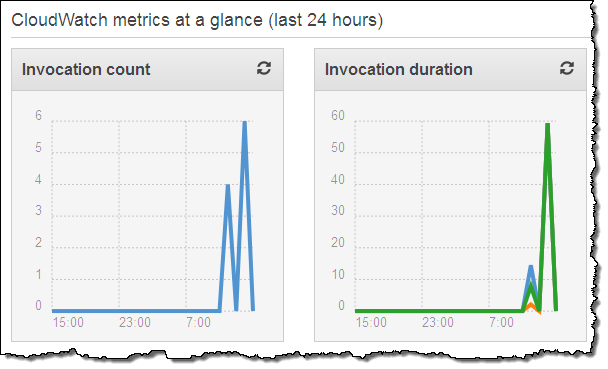 The image below depicts one of the simulations that was run on AWS. It shows how the collision of two protons creates energy that then becomes new particles. The additional 58,000 cores represents a 4x increase in Fermilab’s computational capacity, all of which is dedicated to the CMS experiment in order to generate and reconstruct Monte Carlo simulation events. More than 500 million events were fully simulated in 10 days using 2.9 million jobs. Without help from AWS, this job would have taken 6 weeks to complete using the on-premises compute resources at Fermilab. This simulation was done in preparation for one of the major high energy physics international conferences, Recontres de Moriond. Physicists across the world will use these simulations to probe nature in detail and will share their findings with their international colleagues during the conference. The HEP Cloud project aims to minimize the costs of computation. The R&D and demonstration effort was supported by an award from the AWS Cloud Credit for Research. HEP Cloud’s decision engine, the brain of the facility, has several duties. It oversees EC2 Spot Market price fluctuations using tools and techniques provided by Amazon’s Spot team, initializes Amazon EC2 instances using HTCondor, tracks the DNS names of the instances using Amazon Route 53 , and makes use of AWS CloudFormation templates for infrastructure as a code. While on the road to success, the project team had to overcome several challenges, ranging from fine-tuning configurations to optimizing their use of Amazon S3 and other resources. For example, they devised a strategy to distribute the auxiliary data across multiple AWS Regions in order to minimize storage costs and data-access latency. The figure below shows elastic, automatic expansion of Fermilab’s Computing Facility into the AWS Cloud using Spot instances for CMS workflows. Monitoring of the resources was done using open source software provided by Grafana with custom modifications provided by the HEP Cloud. Modern HEP experiments require massive computing resources in irregular cycles, so it is imperative for the success of our program that our computing facilities can rapidly expand and contract resources to match demand. Using commercial clouds is an important ingredient for achieving this goal, and our work with AWS on the CMS experiment’s workloads though HEPCloud was a great success in demonstrating the value of this approach. I hope that you enjoyed this brief insight into the ways in which AWS is helping to explore the frontiers of physics! We are launching CloudWatch Events in the US East (Northern Virginia), US West (Oregon), EU (Ireland), and Asia Pacific (Tokyo) regions. It is available now and you can start using it today! 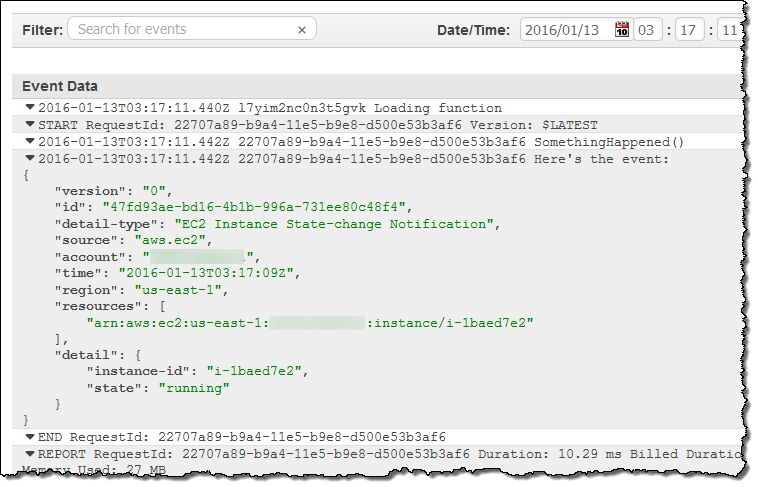 Last November I gave you a heads-up that we planned to increase the length of the resource IDs for EC2 instances, reservations, volumes, and snapshots in early 2016. We are now entering a transition period that will last until early December (2016). During this period, you can opt in to the new format (a resource identifier followed by a 17-character string) on a region-by-region, user-by-user, type-by-type basis. 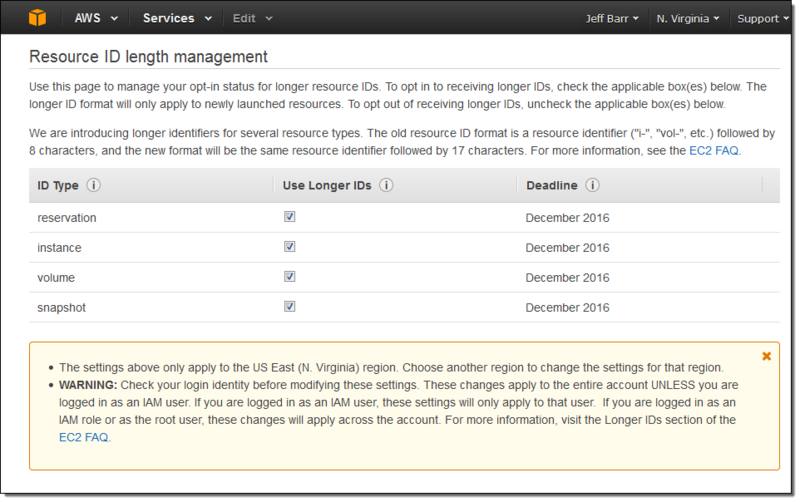 Once you opt in for a given region and IAM user (or for the root account), newly created resources will receive the longer IDs. 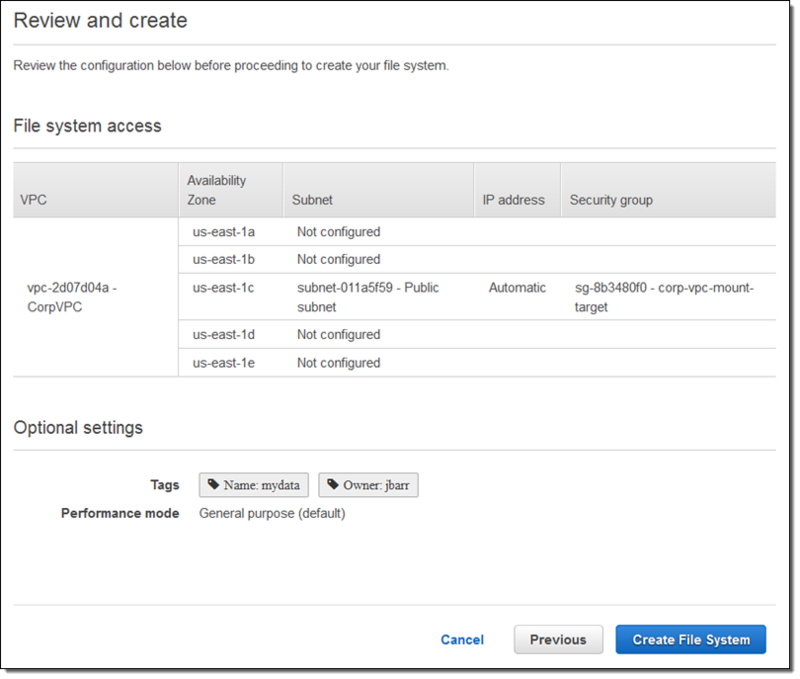 Effective today, you can opt in to the new format for EC2 instances and EC2 reservations. 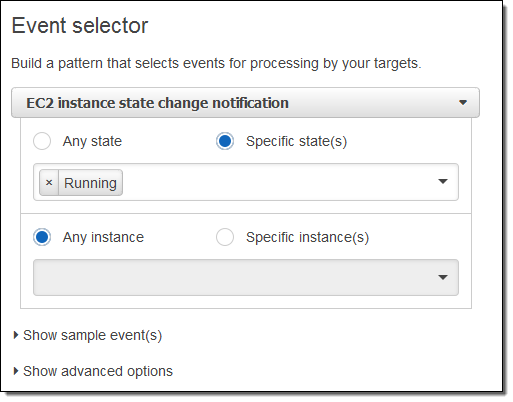 Each reservation represents the results of a single instance launch request, and can be associated with multiple instances. 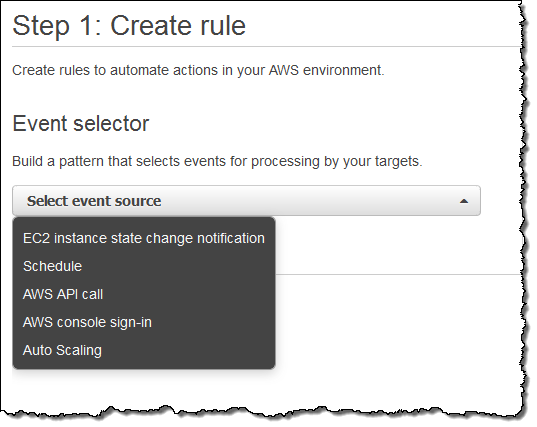 You can opt in to the new format using the AWS Management Console, the AWS Command Line Interface (CLI), the AWS Tools for Windows PowerShell, or though an API function.You can also opt out if your testing uncovers issues that you need to address. To opt in from your own tools or application code, call the ModifyIdFormat function, specify the resource type (instance or reservation), and set the UseLongIds parameter to True. You can opt in at the IAM user or account level. After you have opted in, newly created resources of the specified types will receive the new, longer identifiers as soon as the setting takes effect (typically a few minutes). 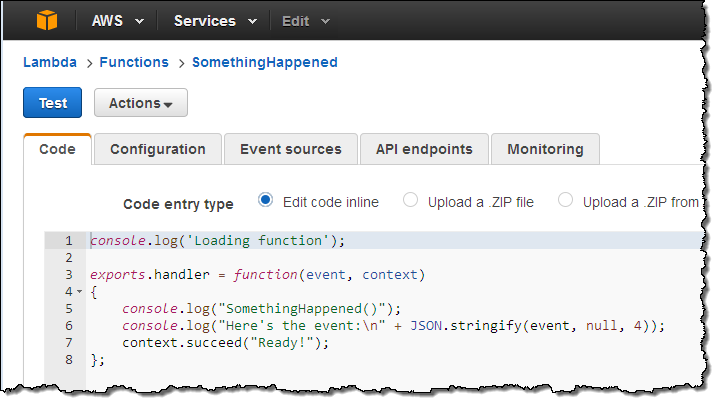 The identifiers will be visible in API results, the command line, and the console. If a particular IAM user opts in and then creates some resources, the longer identifiers will be visible to other users, even if they have not opted in. 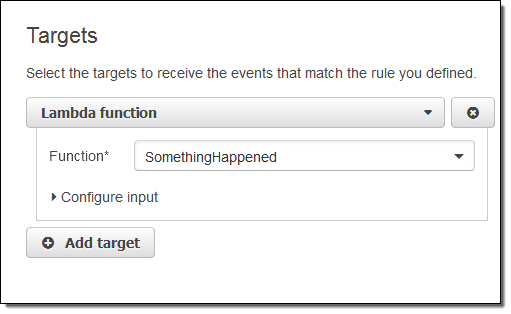 You may want to create a separate AWS account for testing purposes in order to avoid confusion. You can also choose to do your testing in an AWS region that you don’t use on a regular basis (see the AWS Global Infrastructure page for a list of current and planned regions). 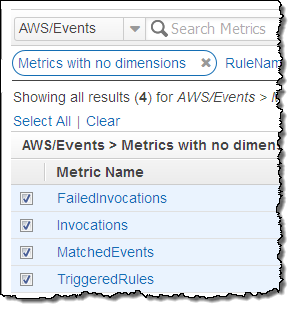 This blog post applies to all AWS regions and accounts. 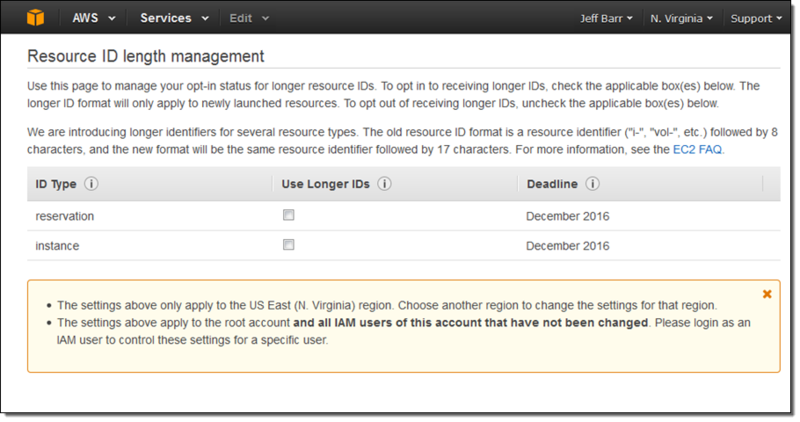 AWS accounts created on or after March 7, 2016 will default to longer instance and reservation IDs, and can be opted out if necessary. After you have performed your testing and are satisfied that your tools, code, and applications work to your satisfaction, we recommend that you opt in for all of your AWS accounts before December 2016. This will give you confidence that no surprises will arise when the new identifiers become mandatory. 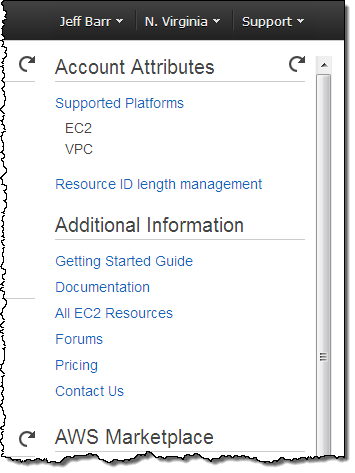 To learn more about this important update to AWS, please read the Longer EC2 and EBS Resource IDs FAQ. PS – We’ll be adding support for EBS volumes and snapshots in April; stay tuned for more information.